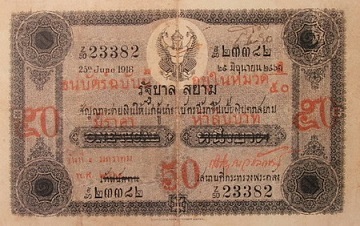 50 Baht type 2 with additional embossed image of the Three-Headed Elephant at the lower middle. The price is on updated process. The first series banknote were introduced in1902 with five denominations; 5 Baht, 10 Baht, 20 Baht, 100 Baht and 1000 Baht. Later, the World War 1 in Europe caused the delay in banknote transportation and affected to the shortage of banknotes. 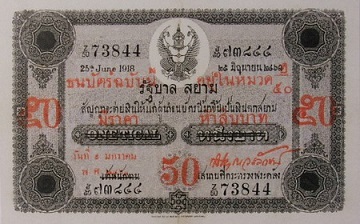 Therefore the Royal Treasury overprinted 50 Baht on the uncirculated 1 Baht denomination then issued them in 1918. There were 2 types with little adjustment in details. 50 Baht type 1 banknotes were announced on 10th January 1918. 50 Baht type 2 banknotes were announced on 2nd March 1918.